Specific California cities and counties have regularly been cited for their civil justice system imbalances by the Judicial Hellholes report since its inaugural edition in 2002. But rather than use that constructive criticism as intended and undertake reforms, things have only tended to get worse throughout much of the state. So much so that all of California was ranked #1 among the nation’s Judicial Hellholes in both 2012 and 2013. And some believed that the costly, never-ending madness in its clogged civil courts had earned a third straight #1 ranking in 2014. But monumentally egregious corruption in New York City’s asbestos court, which has since led to the related arrest and conviction of the Empire State’s once most powerful legislator demanded that California be relegated to #2 last year. Since then the Big Apple has a new top asbestos judge and he has signaled a new opening for fairness there. So California is back on top as #1 – the worst of the worst – in 2015. And though a lengthy book could be written each year about the state’s irrepressibly plaintiff-friendly lawmakers and judges, and its often preposterous lawsuits and sometimes incredible court decisions that only encourage still more litigation, readers are asked to understand that space limitations afford only a relatively brief discussion of particularly troubling issues. Just after the California State Legislature’s regular session mercifully came to a close in 2015, a Sacramento Business Journal recap of the action rendered these figures: 2,300 bills had been proposed, 941 made it to the governor’s desk, and 808 were actually signed into law. That isn’t a misprint. A legislature hugely influenced by plaintiffs’ lawyers and checked only by an occasionally practical governor saw fit to create 808 new laws, many of which, by design, will lead to still more litigation and related costs that for many years have helped drive businesses, along with their jobs and tax revenues, out of the once Golden State and into the arms of less litigious jurisdictions around the country and across the globe. 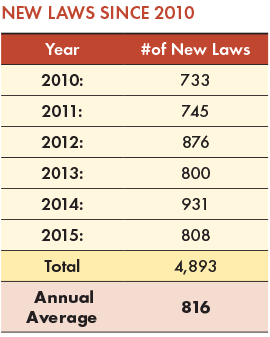 Lest readers of this report mistakenly conclude that 808 new laws in one year is a cherry picked anomaly used for ideological ax-grinding, all are invited to view annual new-law tallies since 2010 on the state legislature’s official website. So, in a state where citizens and businesses can’t possibly be expected to stay abreast of the many hundreds of new statutes and attendant rules churned out by hyperactive lawmakers and regulators each year, it’s no wonder that the latest data available from the Court Statistics Project of the National Center for State Courts show that more than a million new lawsuits are being filed annually in California’s state courts alone. Tens of thousands more are filed in federal courts there. As suggested above, there are times when Governor Jerry Brown seems to understand that, in order for California to someday make good on the obligations of its unfunded trillion-dollar government pension system and hundreds of billions in additional debt, his state has to grow its tax base by becoming less hostile to business and more skeptical of a politically powerful lawsuit industry that parasitically works to erode that base. The governor won kudos from the business community in 2015 when he vetoed a bill that, contrary to nearly 90-year old federal law, would have banned mandatory employee arbitration agreements and another that would have expanded employee eligibility for unpaid time off of up to 12 weeks. But Brown also was cheered by trial lawyers and organized labor for signing into law measures that, among other things, guarantee grocery workers 90 days of job protection after an ownership change and remove the right of corporate chains to fire franchisees unless franchisees substantially breach their contract. Meanwhile, California Attorney General Kamala Harris, from whom the state’s armies of public and private sector attorneys take many cues, was ranked in 2015 as the nation’s fourth worst attorney general in a periodic report by the free-market oriented Competitive Enterprise Institute, a Washington-based think tank. The report said she has disregarded repeated court warnings of prosecutorial misconduct, misleadingly rewritten the wording of ballot measures in order to sway voting outcomes, and thwarted mergers that would have saved struggling hospitals as a political favor to unions. The same federal judge who in open court reamed Harris’s office for prosecutorial misconduct (in a criminal case) also implicitly criticized state judges when he said, “It’s a little disconcerting when the state puts on evidence, the evidence turns out to be fabricated, [and yet] nothing happens to the lawyer and nothing happens to the witness.” The same criticism could be leveled at California judges presiding over civil matters insofar as they rarely if ever sanction plaintiffs’ lawyers for comparable misconduct. And that phenomenon really sets the table for so many of the imbalances plaguing California’s civil justice system. As this report has chronicled for many years, California is to disability access litigation what Madison County, Illinois, is to asbestos litigation: the nation’s epicenter. NPR reported last year that more than 40% of the nation’s disability access lawsuits are brought in California. And though lawmakers in Sacramento have made a few wan reform efforts during the past several years, such lawsuits continue to surge. The principal reason the claims are so prevalent in California is that they can be brought by plaintiffs with various alleged disabilities under a combination of both the federal Americans with Disabilities Act (ADA) and state civil rights law, which allows for damages and attorney’s fees. Because these claims can make real money for a certain class of plaintiffs’ attorneys with lots of time, limited integrity and a specialized willingness to browbeat small business owners – particularly minorities and recent immigrants who are unable or unwilling to fight back – this malevolent practice has boomed as a cottage industry. lowered by an inch-and-a-half. It’s simply off to the next small business target for another drive-by fleecing. An NBC Bay Area television investigation revealed that just 31 serial plaintiffs account for roughly 56% of the more than 7,000 ADA claims filed in the state since 2005. This largely wheelchair-centric racket has united California’s small business community in demanding reform. So when Governor Brown this year vetoed Senate Bill 251, saying in a veto message that it contained a modest tax credit for premises renovations that would “make balancing the state’s budget even more difficult,” business leaders were stunned. Nonetheless, there’s hope that enough signatures can be gathered to place the measure before voters and that AG Harris will choose not to cravenly alter its originally proposed language. Despite a 2013 dismissal of a proposed class-action lawsuit against a maker of almond milk, wherein U.S. District Judge Samuel Conti said, “It is simply implausible that a reasonable consumer would mistake a product like soy milk or almond milk with dairy milk from a cow,” lawyers have merely tweaked their allegations and shamelessly continue this line of litigation. And with the insidious rise of pretentious hipsters have come corresponding rises in both “artisanal” product lines the hipsters favor and new class actions alleging that label references to “handmade” or “craft” products are deceptive and thus worth millions to the crafty lawyers driving them. Recent examples of this evolving line of food labeling litigation include Parent v. MillerCoors LLC filed in San Diego County Superior Court in April 2015, alleging that labeling on Blue Moon beer tricks consumers into believing it is a craft beer, even though the only reference on any of its many regulator-approved labels in the past 20 years that even comes close asserts in microscopic print that a particular Belgianstyle ale is “artfully crafted.” Two federal lawsuits also filed in San Diego in November claim that Tito’s Vodka labeling uses the word “handmade” to deceive consumers. And with its early December 2015 ruling in Quesada v. Herb Thyme Farms Inc., California’s Supreme Court blessed yet another line of comparable litigation over labels’ use of the word “organic.” Lower courts had dismissed the claim, saying it was preempted by federal law that establishes standards for and regulates the marketing of organic products. Lead Paint. This report has consistently kept an eye on state attorneys general and, more recently, county and city prosecutors who, often with help from private-sector plaintiffs’ lawyers, pursue deep-pocket corporate defendants with lawsuits that seek to substitute public nuisance law, with its lower standard of proof, for products liability law and its more exacting standard. Though public nuisance lawsuits against companies that stopped making lead paint decades ago had failed in seven other jurisdictions, the scheme to force those defendants to pay for the abatement of peeling and chipping paint won a key 2013 victory with help from Santa Clara Superior Court Judge James Kleinberg. During the bench trial, defense counsel adduced plenty of evidence that showed the paint companies had stopped selling lead paint once science demonstrated its threats to health and child development, and before the federal government ordered a halt to such sales in 1978. They also showed that California suffers no appreciable lead exposure problems, at least not relative to the national average. But that made no difference to the intransigent Judge Kleinberg, and in January 2014, after entertaining post-verdict motions, he ordered three defendant companies to pay $1.15 billion, to be shared among Alameda, Los Angeles, Monterey, San Mateo, Santa Clara, Solano and Ventura counties, and the cities of Oakland, San Diego and San Francisco. Trutanich asks: Who will actually end up paying for all these inspections, abatements and re-inspections? How will owners of structures labeled a “public nuisance” react to “drastic declines” in their property values? And how will governments cope when corresponding property tax revenues fall off? “Perhaps most importantly, a lawsuit like this can create a dangerous negative precedent for our state” when it tries “to attract new manufacturers and other employers,” and it can “create problems in retaining established businesses,” Trutanich concluded. ‘Son of Lead Paint’ or the ‘Attack of the Nuisance Opioids.’ The seeming success of the lead-paint-as-publicnuisance case before Judge Kleinberg inspired comparable litigation in which prosecutors from Santa Clara and Orange counties teamed up with a host of private-sector contingency-fee lawyers in May 2014 to sue five drug makers, alleging they have caused a deadly epidemic of addiction to potent painkillers with a “campaign of deception” designed to promote sales and boost profits. And again, rather than pursue the litigation under products liability law, county prosecutors and their hired guns relied on California’s sprawling and always easily exploited false advertising and unfair competition law, as well as the more adaptable law of public nuisance. Leaving aside the pesky facts that the painkillers in question have been approved by the Food and Drug Administration and require a prescription from a licensed and not readily deceived physician to obtain them, plaintiffs explained that making sure people understand the risks and benefits of drugs like OxyContin and Percocet before taking them is the lawsuit’s “primary goal.” That must mean that extracting hundreds of millions of dollars from drug makers to be poured into county coffers and the personal bank accounts of multimillionaire personal injury lawyers who’ll likely support the prosecutors’ future political campaigns is only a secondary goal. Not one case cited by plaintiff involved, and indicated the propriety of, a court immersing itself in the convoluted, exacting, expertise-driven, issue-expanded, nuanced action which is involved here. The patients, potential patients, and the medical community deserve more. This action could lead to inconsistencies with the FDA’s findings, inconsistencies among the States, a lack of uniformity, and a potential chilling effect on the prescription of these drugs for those who need them most. The proposed ongoing role of the court in this litigation, and in the monitoring of any decision it makes, is a monumental endeavor. The court does not shrink from its responsibilities to handle complex, convoluted litigation; it handles such matters every day of the week. It does, however, take pause at involving itself in an area which is best left to agencies such as the FDA who are designed to address such issues. This case, and its dismissal, show why local governments should be loath to get wrapped up with private-sector plaintiffs’ lawyers seeking to maximize their profits instead of justice in the public interest. 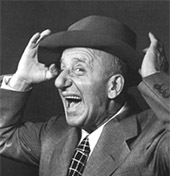 More evidence that the late, great entertainer Jimmy Durante was right when he said, “Everybody wants ta get inta the act” comes with yet another government body in California – the Orange County Water District (OCWD) – jumping into bed with profit-, not justice-seeking plaintiffs’ lawyers and having little to show for it. Granted hefty powers to pursue litigation against those it accuses of polluting water in the area, the OCWD has the authority to recover pollution remediation costs along with all courts costs and attorney’s fees. And while a secretive contingency-fee arrangement with outside law firm Miller, Axline & Sawyer seems to be benefitting the firm, observers say the OCWD in recent years has produced very limited benefits by way of actual remediation. Squeezing settlement money out of those defendants who can afford it and just want to move on is one thing. But the OCWD has had a tougher time proving in court that a threat to drinking water actually exists or that a particular defendant had anything to do with specific allegations of pollution. The lawsuits persist nonetheless, adding to the state’s dispiriting litigation climate and surely helping to convince some defendant companies to consider relocating their operations, jobs and tax revenues to other states. Meanwhile, the OCWD’s track record for remediation of groundwater contamination has been so spotty that the U.S. Environmental Protection Agency announced in September 2015 that it is stepping in to take the lead in clean-up with “assistance” from the OCWD “as needed.” So it’s fair for Orange County taxpayers and voters to ask why local water authorities have gone to such great lengths to increase private-sector lawyers’ wealth while doing so little to increase water quality. A perennial issue in several California jurisdictions for many years now has been the steady flow of asbestos lawsuits, often filed by out-of-state plaintiffs. Although preliminary data on new-case filings from the state’s major asbestos courts (63 in Alameda and 85 in San Francisco through November, and 121 in Los Angeles through August) suggest 2015’s year-end totals may come in slightly lower than 2014’s, large asbestos verdicts have not abated. A Los Angeles County verdict in April 2015 awarded $13 million, including $12.5 million for noneconomic damages, to be paid by defendant Colgate-Palmolive. After a two week trial before Judge Randy Rhodes, the jury found the defendant 95% liable for the plaintiff’s mesothelioma which was allegedly caused by her use of talcum powder. The parties settled the case before the punitive damages phase of the trial. Another multimillion-dollar verdict was reached in November 2015 against a non-traditional defendant, Union Pacific Railroad Co., this time in Alameda County. Following a five week trial presided over by Judge Brad Seligman, the plaintiff was awarded $7 million, $6.5 million of which were for noneconomic damages. As the claims were against a railroad company, they were governed by the Federal Employers Liability Act, which prompts application of a causation standard different and less readily challenged than one used in most asbestos cases. But sunny California’s continually dreary cloud of asbestos litigation did offer a silver lining in 2015. In a breakthrough bankruptcy trust order in May, Judge Emilie Elias entered a Case Management Order in Los Angeles County to be applied in all asbestos cases, requiring the disclosure of bankruptcy trust claims. Among other things, the order requires plaintiffs to disclose “all facts relating to all of their alleged exposures to asbestos … regardless of whether those facts have been, or ever will be, included in a claim to a third party for the purpose of obtaining compensation for an asbestos-related injury.” It remains to be seen whether other counties will follow this important lead. Importantly, the California Supreme Court is poised to hear Kesner v. Superior Court (Pneumo Abex) and Haver v. BNSF Railway, which came to different conclusions about whether an asbestos manufacturer owes a duty of care to members of an employee’s household allegedly exposed to asbestos brought home on the employee’s clothing. Other appellate developments worth watching are Melendrez v. Ameron International, a case revolving around workers’ compensation exclusivity, and Greenberg and Sherman v. Hennessy Industries which allege strict liability for harm caused by another manufacturer’s product. Modeled after federal courts’ multidistrict litigation that coordinates and manages mass torts before a single judge (take a Closer Look at MDLs on p. 52), California has established a Judicial Council Coordinated Proceedings (JCCP) to manage thousands of products liability and personal injury claims against the makers of Type 2 diabetes drug Avandia. Lawsuits initially filed in San Francisco in 2007 were later moved to the JCCP in already overburdened Los Angeles Superior Court and are now overseen there by Judge Elihu Berle. The overwhelming majority of these cases have little or no connection to California. Few of the plaintiffs reside in the state or allege their injuries occurred there. The primary defendant, GlaxoSmithKline (GSK), is a Delaware corporation and maintains its principal place of business there. Furthermore, GSK never designed, manufactured or worked on Avandia safety labeling within the state of California. But to sidestep the pesky fact that few of these cases belong in California, the lawsuits have tended to include as an afterthought another defendant, the San Francisco-based McKesson Corporation, a drug distributor. Other Avandia lawsuits filed elsewhere around the country, both in state and federal courts, do not name McKesson as a defendant or even mention the distributor in pleadings. So this secondary defendant’s inclusion in the JCCP is plainly a means by which to keep GSK trapped in California’s plaintiff-friendly courts. Plaintiffs’ lawyers know that naming a local business as a defendant typically precludes federal courts from hearing the case. GSK has filed numerous petitions to remove cases to more appropriate jurisdictions, all of which have been denied. And its petitions seeking review by the Court of Appeal and the California Supreme Court were both denied without guidance. Meanwhile the JCCP has been stuck in a never ending pattern. Individual plaintiffs have withdrawn, settled or won judgments in their various cases. But whenever the whole thing appears to be winding down, a new flock of migrating plaintiffs swoops in. From a peak of 4,400 plaintiffs in 2010, remaining cases had dwindled to 120 by 2012. But then an additional 673 plaintiffs, 94% of whom are not Californians, filed to attach themselves to the JCCP. So with cases now scheduled for trial dates well into 2016 and no telling whether more plaintiffs may look to get in on the action, the JCCP seems poised to continue benefitting out-of-state plaintiffs and their lawyers at the expense of California taxpayers, who provide finite court resources, and many in-state litigants, whose days in court are invariably being delayed. Sacramento Bee editorial writers in August 2015 reacted to an audit that found the State Bar of California had, in order to reduce its backlog of thousands of disciplinary cases, “allowed some attorneys whom it otherwise might have disciplined more severely – or even disbarred – to continue practicing law, placing the public at risk.” The audit also found that the bar, which relies on state lawmakers for annual authorization to collect dues from its members, had bought and renovated a downtown Los Angeles office building at a cost of $76.6 million – $50 million more than what it told lawmakers the building would cost. The Bee supported reform legislation seeking to bring more transparency to bar operations, and Governor Brown signed it into law in October. The San Francisco Chronicle reported in October 2015 that, after a flurry of opportunistically technical lawsuits began targeting public schools and taxpayers in San Francisco, Oakland, Los Angeles and scores of other school districts last year, alleging that students were not getting the lawful minimum requirement of physical education, state lawmakers unanimously passed urgent legislation also signed by Governor Brown in October. The new law creates an administrative complaint process for those wishing to challenge a district’s adherence to the law regarding physical education, deferring or eliminating costly lawsuits. And finally, the Wall Street Journal reported in November 2015 on a case now before the California Supreme Court that “could fundamentally change the way class-action attorneys are paid.” A heroic attorney from Berkeley has waged a decades-long crusade to eliminate contingency fees of, on average, 25% of awards for damages and replace them with by-the-hour fees, arguing that contingency fees can reward attorneys too generously at the expense of their clients. 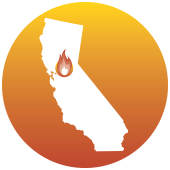 California’s high court is not known for a healthy skepticism when it comes to class-action lawyers, but maybe the justices are finally ready to begin discouraging some of the speculative, no-injury class-action filings that help clog California courts.